I am often asked if I am related to so-and-so Ross. Almost always, the answer is "no". Clan Ross traces its origin back to about the tenth century. At one time, the Clan's territory stretched the width of northern Scotland, touching both the east and west coasts. Eventually, however, the bulk of the Clan was assimilated into Clan Mackenzie. 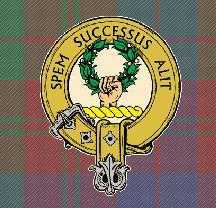 Clan Ross Chieftains, however, remained identifiable and even ascended to the nobility beginning with Malcolm MacHeth, Earl of Ross (ca 1160). However, some assert that the first Earl of Ross was Ferchar mac in tSagairt (ca 1240). In any case, the title of Earl was separated from the Chieftainship in 1372 with the death of Uilleam, the 5th Earl of Ross. During the various Scottish wars — internal and with England — Clan Ross sometimes chose the winning side and sometimes the losing side. In the 18th century, the Clan was severely decimated in battle after choosing the wrong side during a Jacobean uprising. An 18th century Chieftain, another David Ross, had no close male relatives as heirs and sold the Clan's home estate to Charles Ross, who (despite his name) was not a member of the Clan. Charles Ross and his descendants nevertheless assumed the title and role of Clan Chieftains. By the middle of the 20th century, female Chieftains were already well recognized by the Scottish clans. In 1967, Ethel Frances Sarah Williamson Ross, a descendant of a distant relative of 18th century's David Ross, assumed the Chieftainship, restoring the title to the original Clan Ross. Next was Rosa Williamson Ross. The current (2014) chieftan is David Campbell Ross, who lives in Perthshire, Scotland. Much of the above is subject to some dispute as records are incomplete and contradict each other. Although interesting and somewhat romantic, all of the above is irrelevant. On his mother's side, my father had a great-grandfather named either Sidney Harold or Harold Sidney (using the Russian or Yiddish equivalents of those names). Following Jewish tradition, several men in my father's generation were named after their deceased ancestor. Thus, my father had at least two cousins named Sidney and at least one Harold. According to my brother, our father spelled his name Sydney to distinguish himself from his cousins. Interestingly, when my father got a certified copy of his birth certificate to obtain a passport — when he was in his late 50s — it showed his name as Harold Rosenbloom. Yet his parents had always called him Sydney, with Harold as his middle name. The passport was issued in the name Sydney Harold Ross, the same as shown on the 1942 court order for changing from Rosenbloom to Ross. In my generation, there were additional Harolds and Sidneys. Then, my daughter was named after my deceased father, contriving Heather from Harold. Now, in the next generation, there is a girl named Sydney (the way the name is usually spelled for a female). My paternal grandfather, Shmuel Wishny, was born in Czarist Russia, in an area that is now either Lithuania or Latvia. Arriving in the United States late in the 19th or early in the 20th century, an immigration official asked grandpa his name. Following the practice of many of his landsleute (countrymen), he elevated his status from a lowly Russian Jew to a more socially acceptable German Jew and told the immigration official his name was Samuel Rosenbloom, the name that later appeared on his citizenship certificate. Thus, when my father Sydney and his sister Sylvia were born, their family name was recorded as Rosenbloom on their birth certificates. During the Great Depression of the 1930s, my parents Sydney and Lillian Rosenbloom — struggling to earn livings — encountered serious anti-Semitism in employment. At that time, such discrimination was legal. Thus, they assumed the non-Jewish family name Ross. When I was born, my family name was recorded as Ross on my birth certificate. My parents legally changed their name from Rosenbloom to Ross the following year. Thus, the Rosses of my family are quite few, numbering only nine if Rosses by marriage and my deceased parents and son are included. With the exception of my parents and son, all of my Ross family are still living. While a student at UCLA in the early 1960s, I was sometimes confused with David Arthur Ross. His major was Spanish while I received my degree in mathematics. My mother's cousin Marsha, who worked at UCLA, called my mother to complain that she never heard any news from us. Marsha was upset that she had to read the campus Daily Bruin to learn I was going to study for a year in Barcelona. No, it was David A. Ross who was going to Spain on an exchange program. I used to receive phone calls for a David Ross — usually in the middle of the night — from various individuals who had been arrested and thought their "friend" could get them out of jail. Most of those callers sounded quite drunk, leaving me with questions about the kind of friends that David Ross had. The agent for my home-owner's and auto insurance sent me an E-mail. Because my wife and I drive very little — both of us being retired — we have discounts on the premiums for our auto insurance. The E-mail message requested confirmation of our mileage during the prior year. Reading the entire message, I noticed that the agent had the wrong name for my wife, our address wrong, and indicated an automobile that we do not own. Yes, the agent has another client named David Ross and somehow associated my E-mail address with the other client. I have met two other David Rosses face-to-face, both times in doctors' offices. I have also corresponded via E-mail with others. In 2012, Images of America: Oak Park (Arcadia Publishing, ISBN 978-0-7385-9538-2) was published. I was a coauthor of this book, along with Harvey Kern, Harry Medved, and Derek Ross. No, Derek is not related to me. In discussing our backgrounds, however, we discovered that we both came to have the surname Ross in a very similar manner. Derek has a brother named David, whom I have never met. There is a certain anonymity with the name David Ross. The phone book for my area code has over three columns of Rosses with nine David Rosses. Yes, the plural of Ross is Rosses. An apostrophe — as in Ross's — is used only to show possession. Note well: I am NOT an attorney, physician, or university professor. I do not subscribe to FaceBook, MySpace, Twitter, or any other social networking sites. Anyone named David E. Ross who is an attorney, physician, or university professor; who has a FaceBook page; who Tweets; or who is otherwise involved in social networking is someone else, not me.